I had a friend who believed in reincarnation. For her sake I wish she was right. She never said what she hoped to come back as, but if the gods at the ticket booth for the next life are on the ball she'll come back as herself. Because, if you led a good and enlightened life, your next time here is supposed to be a step up, isn't it? But I can't imagine a step up for Linda. I don't see how she could be improved upon. And if she comes back as herself I'll recognize her and then I'll get to talk with her again. I don't believe in anything beyond this life. We're here for a short time and that's it. Dead is dead. But I think of my atheism and materialism the way an amputee thinks of a missing limb. I can still feel my faith from time to time. And just because I don't have it, doesn't mean I don't believe it when I see other people walking around on two spiritual legs. Linda was smarter than me, and more thoughtful. She had a much bigger heart, and she was far and away a better teacher. So I listened when she talked about auras, and karma, and chakras, and old souls and new souls, and coming back in your next life as a beetle or a claims adjuster if you weren't paying close enough attention in this one. Ideas and notions that double me up in laughter when I read about them or overhear people talking about them in the Self-help and Eastern Philosophy aisles at Barnes and Noble I took seriously when she spoke of them. I even half-believed them. When I left Indiana she gave me a crystal as a going away present and I've kept it safe all these years and take it out now and then and hold it, half-expecting it to work some magic on me. It seems oddly right that I have landed in the Hudson Valley, where she wound up. If there are such things as ghosts I expect to meet up with hers some nice day when I'm out on my bike. Linda believed that I had been reincarnated several times. Mine wasn't an old soul, she said, but it had been around the block a few times. Specifically, she was convinced that I'd been alive during the American Revolution. She was sure that was the best explanation for my fondness for all things 18th Century. Ever since I was a kid I've been fascinated by the Revolution. 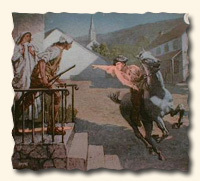 When I was little I used to beg my father to read me Paul Revere's Ride over and over. The first book I remember asking my parents to buy me was The Big Golden Book of the Revolutionary War. The best moment from all our family vacations happened when I was eight and we went to the Drummer Boy Museum on Cape Cod. Room after room of life-size dioramas of scenes from the Revolution, and at the end of it my dad bought me my own tricorn hat! When we got back to the house we were renting I found a stick that I thought was shaped like a flintlock pistol and for the whole rest of the vacation I was a Minuteman. And when I was older, the reason I wanted to go to school in Boston was that it was the Cradle of the Revolution and when I got there it was always thrilling to turn a corner and run smack into a building that Paul Revere and Sam Adams and the other Sons of Liberty ran smack into when they turned the same corners. My first day in town I made a visit to Paul Revere's grave. Just to say hi. Even now, the architecture I appreciate most is Georgian Colonial, the rooms I feel most at home in are the ones that look as if Thomas Jefferson just left them. When I read a history book, it's most likely about the Revolution. (Which reminds me. I've been meaning to get around to Washington's Crossing by David Hackett Fischer. Hold on while I switch over to the library's web site and reserve it. brb. Ok. I'm b.) The figures from American history I admire most, and not only admire but feel I know best, almost as if I've met them, talked with them, even been friends with them, are Adams and Franklin, Jefferson, Washington, and Paul Revere. And when I read letters and journals by soldiers at Valley Forge or the politicians in the Continental Congress, I'm overcome by waves of familiar affection, as if they were written to me or by me. In short, I am so at home in my head back there that it does sometimes feel as if I must have been alive then. Linda said that I was and that was why I was drawn to the period. I think she was reversing cause and effect, but I never argued the point. So you can imagine how much fun I was having the other day when we were up in Kingston watching the British burn the place down. Running after the troops, watching them march and shoot, admiring the uniforms, savoring all the sights and sounds and smells (of gunpowder), I was exhilarated. And at home. Don't get me wrong. Not for a minute did I forget and think I'd gone back in time. As realistic as the re-enactors tried to be, a battle fought under the off ramp of a highway with an audience aiming digital cameras and yelling into cell phones is just not all that convincing. What I was feeling wasn't deja vu at all. But it was curious to me how the booming of the cannons didn't startle me, how the musket volleys didn't surprise me but instead sounded...right. Lots of people around me had their hands over their ears or were holding their noses against the smell of burnt powder, but I wasn't bothered. Like I said, it all felt right, as if I knew how it should be, as if I was comparing it to actual memories and thinking, yes, that's just the way it was. And I heard Linda telling me, "See?" "See," she said, "You know. You were there." Of course I know it was my imagination playing tricks. 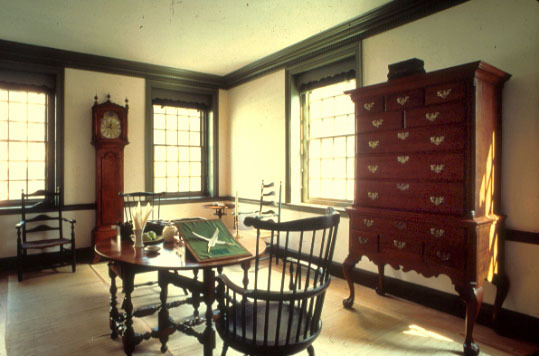 Fed by decades of reading and dreaming and looking at pictures and watching movies and visting Valley Forge and Saratoga and Lexington and Concord and Paul Revere's house and Fort Ticondaroga and the Drummer Boy Museum, my imagination can do a pretty good job of pretend time travel. All I was re-living up there in Kingston was running around the backyard of that house on Cape Cod in my new tricorn hat, waving my flintlock-shaped stick. But it was nice to hear Linda's voice again.